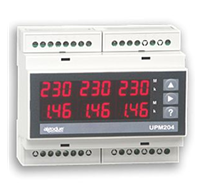 The UPM204 is a digital meter able to measure the electrical parameters on three-phase systems. It provides accurate measurements even by distorted waveform. Six high brightness LED displays provide the three phase parameters quantities simultaneously and ensure maximum visibility even in difficult environment lighting condition. The working parameters can be easily set up by instrument keypad or PC. UPM204 is a compact, cost effective meter operating both as a stand-alone device or as an integral part of a more extensive energy monitoring and management network. UPM204 replaces multiple analog meters as well as single function meters such as voltmeters, ammeters, wattmeters, varmeters, frequency-meters, powerfactor-meters, energy-meters, etc.